Gary Shingledecker did his best to get his high school team over the top in this August 1985 game, but it wasn't enough. Shingledecker made it to the plate six times, picking up five hits. He scored twice and knocked in two. His Franklin High School came up just short, losing 13-12, according to The Beaver County Times. Shingledecker went on from Pennsylvania's Franklin High to play in college and in the pros. His pro career, though, ended up being brief, just two seasons. He never made AA. 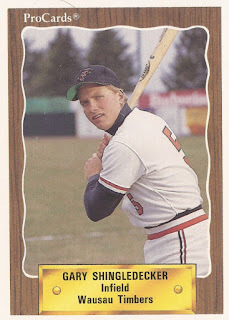 Shingledecker's pro career began in 1989, taken by the Orioles in the 11th round of the draft out of North Carolina State University. He went to NC State out of Franklin High in Franklin, Pa.
At Franklin High, Shingledecker led his team in hitting each of his four years there. After graduating in 1986, he went on to North Carolina State, earning second-team all-conference honors in 1989. He tied a conference tournament game with a home run, then later won it with another, according to his Best card. He hit a two-run home run in a March 1987 game. With the Orioles, Shingledecker started in 1989 at short-season Erie. He hit .231 in 50 games. He also hit one home run and knocked in 12. He moved to single-A Wausau for 1990, but he played only briefly. In 24 games, he hit .243. He hit another home run and batted in six, ending his career.